What is a Montana Month to Month Lease Agreement? Montana Month to Month Lease Agreement: What Is It? 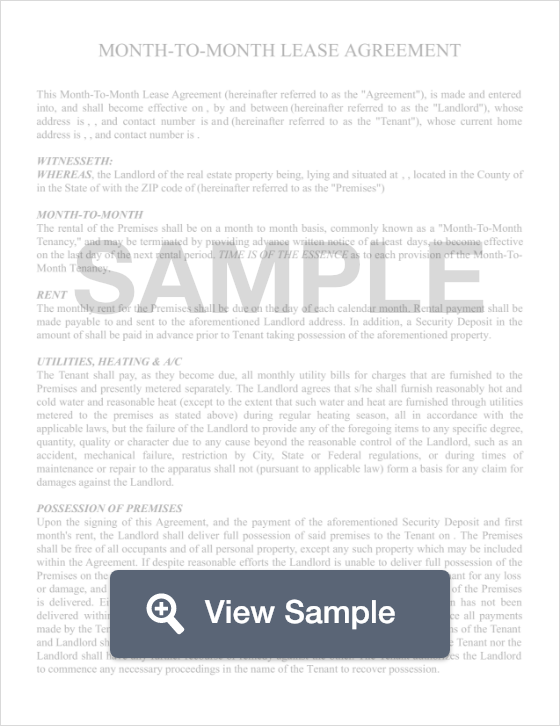 In Montana, a month to month lease agreement is a legal document used to officiate an at-will tenancy agreement between a landlord and a tenant. This means that the lease agreement will be open-ended, renewing automatically at the beginning of each month until the landlord or the tenant decides to terminate the agreement. Oftentimes, landlords prefer long term leases because they are essentially guaranteed that they don’t have to go through the process of searching for an ideal tenant, however, these agreements can work well for both the landlord and the tenant. For landlords, these agreements mean that they have more flexibility with the rent prices. If the market changes, the landlord doesn’t need to wait until the end of the traditional yearlong lease to change the rent on the apartment, he or she may do so with a month’s notice. Furthermore, if the landlord is having problems with the tenant, he or she doesn't have to wait until the end of a yearlong lease to terminate the agreement, a simple 30-day notice will suffice. For tenants, a month to month lease works well because they have the option of only renting the apartment for as long as they need it. Regardless of who terminates the lease first, the landlord or the tenant, it must be done with written notice at least 30 days in advance. According to Montana law, anyone who wishes to terminate a month to month lease agreement must do so in writing at least 30 days before the termination effective date. In Montana, the tenancy is terminated on the date specified and not contingent on when the rent is paid.